China Courier Service Corporation is a wholly owned subsidiary of the Post Bureau, which operates both international and domestic mail services. More than 20,000 professional couriers are employed by the company and as many as 200 countries get mail delivered to via these couriers. Despite the huge improvements in the infrastructure of China’s cities like Shanghai and Beijing, the rural areas still have a long way to go before they can fully enjoy modern advancements. 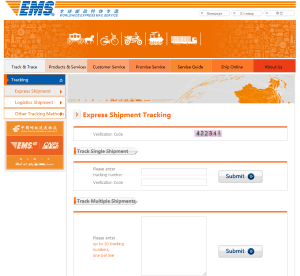 So whether you are receiving or sending packages to China, it is best to use the EMS tracking system. You will find this track-and-trace service quite invaluable. While it is true that EMS still has not fully progressed to the highly professional level that you may have gotten used to in the UK, it is nevertheless improving all the time. While there is no absolute guarantee that you receive your package, at the very least, you will be able to find out where the delivery process got delayed or broke down so that you can avoid that part of the system next time. With the latest service for national and international tracking of packages, EMS China has now allowed businesses to expand their imports and exports further. This is the main reason many industries prefer to use this courier company even though the standard of its services does not match some other couriers in UK, Japan or USA. Shipping and tracking services of EMS are essential parts of business as customers want to know the exact location of their package no matter where it is to be sent. Thanks to the advanced tracking procedures today, you can get all this information at any time of the day or night. Before this track-and-trace facility was launched, customers had to call up the delivery company to find out where their parcel was. In all too many cases, you couldn’t get accurate information and the response from the company was often slow. If an important business package does not arrive on time, the firm may lose its credibility or invalidate its contract with the client. However, with EMS tracking, users can now easily access their computer system via the Web, enter a code for the item that is being shipped (this code is assigned to you when you first drop off the package at the shipping company) and then locate the package and estimate how long it will take to arrive at its destination. The tracking system not only lets customers know of their parcels’ whereabouts, but it also tells them what other methods are going to be utilised to get it to its final destination. If for any reason, the type of transportation that is being used for delivery is delayed, then your parcel will more than likely arrive late. While this system may not be perfect, it is still a huge improvement on what was available before its creation. The next time you need to send or receive an item that is of urgent nature, make sure you keep the tracking code that the courier company provides you with. With this reference number, you will be able to follow the path of your package in real time, and find out whether it will face any problems or delays along the way. The ability to track packages via EMS has greatly enhanced the efficiency and effectiveness of the global integrated delivery structure, so much so that most items are now delivered when they are supposed to and where they are supposed to. Since EMS began operating in 1980, the volume of services has grown while the quality has also increased. In addition to domestic and international courier services, the company has introduced next-day deliveries to domestic regions, international guarantee services, prompt delivery and collection as well as high-end products. EMS now has a 3-in-1 real-time track-and-trace system including its own website and call centre facility. There is no denying that China’s postal service has suffered a handful of problems in the past few years. Sometimes, the process of delivery can break down due to unforeseen delays. However, as the country progresses and prospers day by day, its postal service has now started to evolve and is keeping up with customers’ demands. Healthy business growth for EMS and fierce competition from its rivals highlighted the firm’s lack of IT infrastructure. As a result, it decided to create a 3rd generation track-and-trace platform for customers. Since this system was launched, EMS has witnessed a significant increase in business. The platform now handles up to 5 million data records per day with numbers still on the increase. During the busy times, the number of customer queries can reach up to 70,000 per hour. Track-and-trace system has achieved many goals, one of which includes offering the latest mail delivery status within a few minutes. With the launch of this new system, inaccurate information can easily be screened as well as any discrepancies in the internal or external communication. Every item of express mail goes through a number of procedures from collection to delivery. International mail needs additional info about transportation, delivery and UPU system. The most urgent issues are loaded from multiple sources within ten minutes of transactions. To deal with complex information sources for timely data loading, EMS uses the latest technology to exchange the data between different systems. Due to the unique circumstances of the way EMS operates, (half courier service, half fast post service) it tends to be somewhat faster than airmail, and depending on the destination that the mail needs to go to, EMS couriers may be the cheaper alternative. In addition to being a little cheaper, your package is less likely to go through endless customs checks, unlike most other courier parcels in some countries. This can make China Courier Service a good shipping choice for importing small packages into restrictive destinations. What’s more, when you choose EMS, your package will be tracked easier than airmail. The average parcel that is shipped by EMS takes on average 7 days to be delivered. It can be tracked from the website and some post offices. The package is covered by the Chinavasion Delivery Guarantee. People often prefer to use this courier service due to its smooth customs clearance, especially if they wish to send parcels to strict countries like Greece, Bulgaria, Turkey, and Russia. To offer the same service to rural areas, EMS has made its postal services available in many different areas without paying too much for costs. The company works with hired contractors to save money on expenses. It has thus far been successful in providing collection on delivery services. However, it can sometimes be a little slower than other couriers, but what you lose in one area you will get back in another as your parcel will reach its destination without the gruesome customs inspections. To find out the shipping costs for your parcel, you need to sign up on the website of EMS, and then enter the quantities to see the various shipping fees. Depending on which shipping method you choose, you will be able to calculate the price. In most cases, the package is treated as airmail unless it weighs 60 pounds or more. Once you see the EMS option come up at checkout, it means your parcel can be sent to your chosen destination. If you don’t see the EMS logo in the courier section, then it is best to visit your nearest post office. To ensure prompt arrival of your parcel, you must write your name and address plus the recipient’s details together with phone numbers. Your package will not be accepted for shipment delivery if the full address of the receiver is not included. EMS do not accept responsibility for delivery delays that are caused by incomplete address. For safety purposes, dangerous items and cash are not allowed to be sent to any country, and proper packaging materials must be used in accordance with the Postal Law to ensure the contents of shipment are not damaged. The following items are prohibited for delivery: Explosives, toxic materials, currencies, pornographic materials, perishable items, animals, goods that are improperly packaged so that they risk public safety, and any other package that is not suitable for mailing. and help me out or track my parcel please. I ordered a duvet set and matching pillow cases from a company called Manchesterplus through eBay and paid via Paypal on the 8th December 2015. As I hadn’t received anything to date (2nd January 2016), I decided to track the shipping number. It was sent via Australian International Express Post to the UK and then passed over to yourselves, EMS, for delivery in the UK. The Australian Post website says that there was an attempted delivery on Tuesday 15th and Thursday 17th December. However, the delivery person didn’t leave a missed delivery note/card, otherwise I would of rang yourselves to collect the parcel before Christmas. I just assumed as I ordered the parcel close to the holiday season, that it hadn’t arrived in the uk yet, due to the Christmas post. The tracking number is ER000235085AU. Please can you local where my parcel is being held and contact me with the relevant information (telephone number and address). If it is local, e.i in Swindon where i live, then i am happy to come and collect it myself if that is easier. However, if it is further away is another cities deep, then i would prefer it to be redelivered with a time slot, so that i can ensure i am at home to receive it. I’m sorry to tell you, but we can’t locate your parcel from here. Please call or visit your local EMS station, where you give your package away. They can tell you more details about your EMS parcel. Is it wise to let everyone know what your full name, address and telephone number is? I ordered my item for a xmas gift. Today 24th december it has not arrived. It was posted on 19/12/2015. What does that mean and where is it. Track and trace is not giving me any information. I just want to know where ny parcel is!